Charles P. Lazarus (b. 1923) was born in Washington, D.C., and grew up working in his father’s bicycle shop. After returning from combat in World War II, he opened his first business, a baby furniture store called ‘Children’s Bargain Town’. 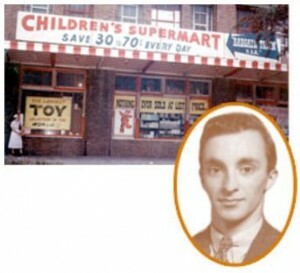 In 1950, Lazarus responded to customer requests and began selling baby toys in his store. He quickly realized that toys are a much better business than furniture, as they break often, get boring quickly, and parents are always looking for new gifts for their kids. Lazarus had a vision of toys becoming an everyday commodity, as opposed to a seasonal item. He decided to try a new store concept, modelling on the self-serve grocery stores that were becoming very popular at the time. Thus, Lazarus opened the first ‘Children’s Supermarket’, which still stands today in Washington. His motto: “Give the customer what they want.” In 1957, as business boomed, Lazarus opened a second store, calling it ‘Toys “R” Us’. The chain has since expanded to over 1,600 locations around the world, employing over 100,000 people, and becoming one of the most recognizable brands globally. Lazarus personally oversaw the bulk of this growth, running his company for 46 years before stepping down as CEO and Chairman in 1994. The company continues to give back to the community with its Children’s Fund donating millions of dollars to countless children’s programs. Recently, Toys “R” Us began to cover the roof of its distribution centre with solar panels, creating a 5.4 megawatt, clean energy generator – the largest such project in North America. This entry was posted in Business & Finance and tagged American Jews, Babies R Us, Children's Supermarket, Furniture, is charles lazarus jewish, Kids R Us, Solar Power, Supermarket, Toys, Toys R Us, Washington D.C., World War II on June 26, 2013 by Jew of the Week.